World Cup winner Mike Tindall and fly-half Charlie Hodgson have both been omitted from England's World Cup squad. The pair were both denied the chance to prove their recovery from long-term injuries, but Lawrence Dallaglio and Andy Farrell are both included. The other three backs left out are full-backs Nick Abendanon and Dan Cipriani and centre Toby Flood. Prop Kevin Yates, lock Tom Palmer and back-row James Haskell are the unfortunate forwards to miss out. Nick Easter, who scored four tries against Wales nine days ago, is included in the back-row options alongside Dallaglio, one of 12 survivors from the original 2003 squad. The others are captain Phil Vickery, Mike Catt, Jason Robinson, Josh Lewsey, Jonny Wilkinson, Andy Gomarsall, Mark Regan, Martin Corry, Ben Kay, Lewis Moody and Joe Worsley, while Simon Shaw was a replacement but did not play. France-based Perry Freshwater, who can play on either side of the scrum, has been preferred to Yates as the fourth prop. Palmer misses out with Kay and Steve Borthwick joining Simon Shaw and Martin Corry as the second-row options. Head coach Brian Ashton has dispensed with the majority of his young backs, Abendanon missing out despite a promising first start against France on Saturday. There is no specialist full-back, with Sale wing Mark Cueto, who ended the Six Nations in the number 15 jersey, the likely starter with Josh Lewsey and Jason Robinson as back-up. What do you make of England's World Cup squad? Leicester centre Dan Hipkiss, who made his debut in the first World Cup warm-up Test against Wales, makes the cut, as does Jamie Noon after a strong display against France. Rugby league convert Farrell is also included, at the expense of Flood, despite being widely criticised for his lack of pace in the union game. But the England management have praised his leadership qualities and mental toughness, making him defensive captain against Wales. He will compete for the inside centre jersey with Mike Catt, 36 next month, who will equal Jason Leonard's England record of being selected for four different World Cup campaigns - 1995, 1999, 2003 and 2007. Ashton said he had to make "some very difficult decisions" in reducing his squad to the final 30, praising all 47 members of his original training squad for their "tremendous amount of effort" and "first class attitude". "I spoke to each of the players who would not be involved in the final 30 yesterday (Sunday), and they were all obviously very disappointed not to be included," he added. "But I stressed to each of them that they could be invited back if a member of the squad suffers an injury either before, or during the World Cup. 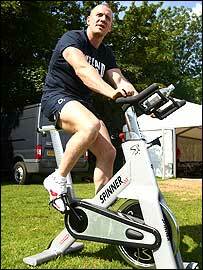 "Mike Tindall has worked very hard to recover from his injury, and he was running last week. "But it was agreed by the coaches that he and Charlie Hodgson, who is fit but like Mike has not played top level rugby for a number of months, could not use the final warm-up Test (against France on Saturday) or the World Cup pool games as part of their rehab. "Both of them have done everything that has been asked of them, and I wish them both well with their return to their clubs, and the other players who have not made the final 30." European champions Wasps provide the biggest single club representation with seven players, followed by five from Leicester. Wasps skipper Dallaglio, 35 last Friday, is the most experienced member of the squad with 79 caps, but former England captain Will Carling has questioned whether Dallaglio should have been included. "Sometimes the nature of someone like Lawrence can be a problem in a squad if he's not a captain and there are not very strong guys to keep him in check," Carling told BBC Radio 5live. "They are obviously not going to make him captain at the World Cup. And if you take him, does he end up being divisive if he's not in the team?" Ashton will announce on Tuesday his team to tackle France in Marseille this Saturday. England's opening World Cup match is against the USA in Lens on 8 September, followed by further pool games with South Africa, Samoa and Tonga. Backs (14): M Cueto (Sale - Age 27, 19 caps); J Lewsey (Wasps - 30, 48 caps), J Robinson (unattached - 33, 45 caps), P Sackey (Wasps - 27, 3 caps); D Hipkiss (Leicester - 25, 1 cap), J Noon (Newcastle - 28, 25 caps), M Tait (Newcastle - 21, 12 caps); M Catt (London Irish - 35, 70 caps), A Farrell (Saracens - 32, 4 caps ); O Barkley (Bath - 26, 17 caps), J Wilkinson (Newcastle - 28, 59 caps); A Gomarsall (Harlequins - 33, 26 caps ), S Perry (Bristol - 29, 11 caps), P Richards (London Irish - 29, 6 caps). 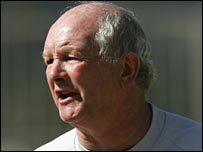 Forwards (16): G Chuter (Leicester - 31, 12 caps), L Mears (Bath - 28, 16 caps), M Regan (Bristol - 35, 37 caps); P Freshwater (Perpignan - 34, 7 caps), A Sheridan (Sale Sharks - 28, 13 caps), M Stevens (Bath - 24, 13 caps), P Vickery (Wasps - 31, 54 caps); S Borthwick (Bath - 27, 28 caps), M Corry (Leicester - 33, 56 caps), B Kay (Leicester - 31, 46 caps), S Shaw (Wasps - 33, 36 caps); L Dallaglio (Wasps - 35, 79 caps), N Easter (Harlequins - 28, 5 caps), L Moody (Leicester - 29, 45 caps), T Rees (Wasps - 22, 5 caps), J Worsley (Wasps - 30, 59 caps). Omitted: N Abendanon (Bath), D Cipriani (Wasps), T Flood (Newcastle), J Haskell (Wasps), C Hodgson (Sale), T Palmer (Wasps), M Tindall (Gloucester), K Yates (Saracens).